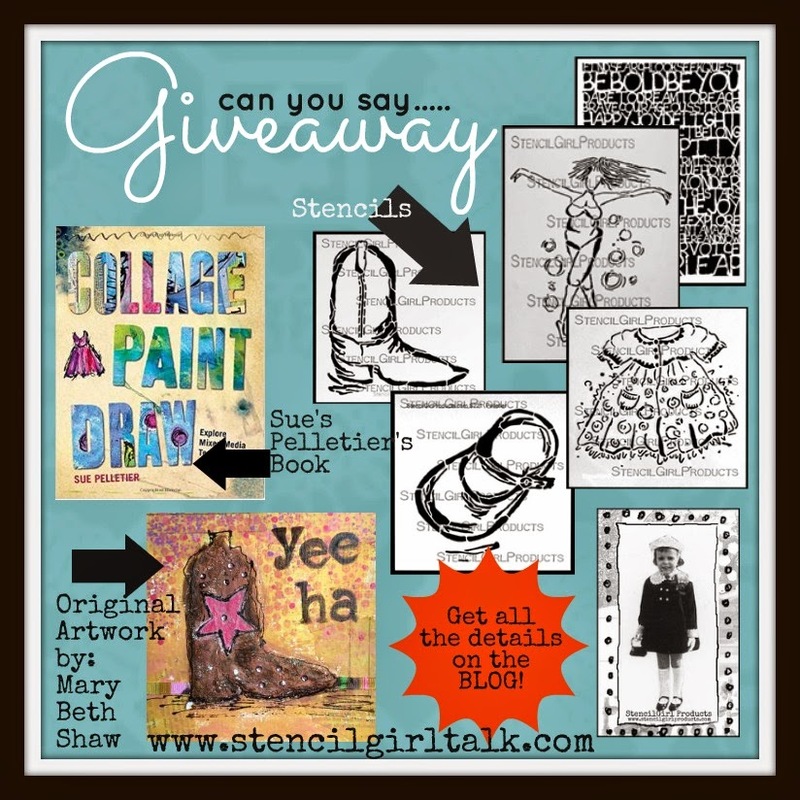 StencilGirl Talk: Mary Beth's Book Club Featuring Sue Pelletier and a Giveaway! Mary Beth's Book Club Featuring Sue Pelletier and a Giveaway! 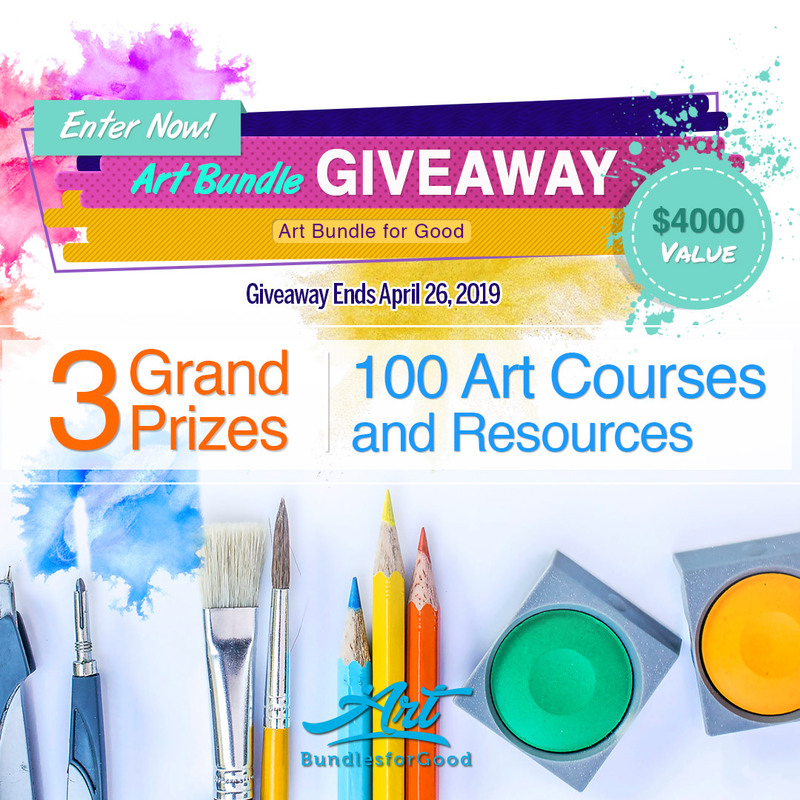 There is still time to sign-up and we are so excited that we are celebrating with a GIVEAWAY!!!! Sue Pelletier's NEW book Collage Paint Draw!!! 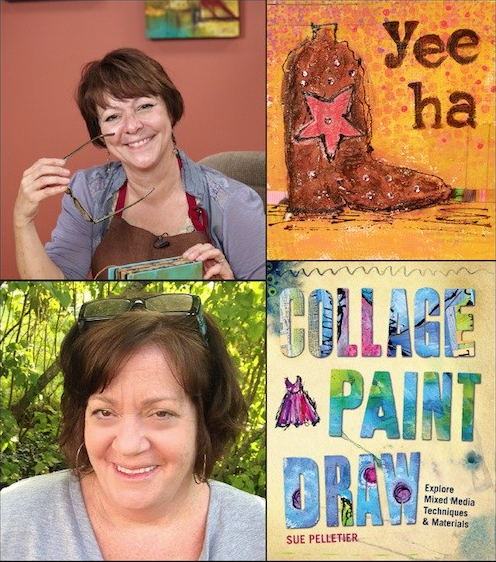 Join Mary Beth Shaw as she welcomes Sue Pelletier, author of Collage Paint Draw, for an hour-long live web seminar! During this online event, Mary Beth will show you how she combined techniques from several projects in Sue's new book to create a dimensional, textural mixed-media collage with lots of flair and kick. During the presentation, Mary Beth will talk to Sue about choosing personal imagery, using unusual materials like rigid wrap and more. Then they'll answer your questions on the air. A unique GoToWebinar registration link. 48 hours after the live event you'll receive a recording of the full webinar plus a demonstration video, not shown during the live event, of Mary Beth creating the complete project. You'll also receive a supply list so you can create the project. Spend an hour with Mary Beth and Sue Pelletier with video demo's and tons of laughs all for the awesome price of just $6.99!!! Registration Link. We are so excited about Sue's new book that we are giving one away! Not only that you will receive the piece of art that Mary Beth made for the webinar!!! Want more?? How about some stencils so you can make your own piece of art with what you learn in the webinar??!!! Yes! this is one awesome prize!!! All you have to do is leave a comment below telling us what your personality is more like....a Cowboy Girl or a Mary Jane Girl and also what is the reason you do (or do not) sign-up for webinars and online classes. I am Mary Jane girl. I love online classes because I live out in the middle of nowhere! Cowgirl! I love girly things but don't like taking time to pretty up. I'd rather be outside with my dogs watching birds and other things out in nature. I love online classes but don't make it to webinars. It's so selfish but I worry that other students will take up too much of the set time with questions and comments. In the classes it enhances but with webinars it can use up too much of the set time. I love online classes, and would as far as saying I am addicted. Not much opportunity for in-person classes where I live, so I've overdosed on the online version. Webinars are difficult for me to fit into my schedule, so I've not signed up for any. I guess I'm a farm girl but I kinda like Mary Janes!!! GUessing I am more a Mary Jane kind of girl. Not a big fan of the outdoors. WOuld love this opportunity to be able to attend this and to have the book! Thanks for the chance! Mary Jane! Love the convenience & opportunities to learn of online classes. I love Mary Jane shoes...had a red leather pair til I wore them out! mostly a cow girl, with a little bit of Mary Jane thrown in for good measure. I've done some online classes but mostly don't have the money or time to do or watch them. Plus there's so many out there how do you choose. I'm more of a Mary Jane girl. I'm too old to be a cowgirl. I don't sign up for webinairs because I never seem to look at them after I've signed up. I have a week's worth of card making classes and I've looked at one episode. Mary Beth's class is at a specific time - whenever I plan my time something always happens and I'm not available at the time. I'll quit whining. I'd love the book and all of the other pieces in the prize. thanks. I'm definitely a Mary Jane girl! I even have a pair...in pastel plaid! I love getting all girly!!! I could not find a section that said it was being recorded so I could watch at later time. Sorry I will miss it. I wish I was more of a cowgirl, I love the boots! But my feet prefer the mary jane styles. I met a real live cowgirl a couple of years ago and she actually GAVE me a pair of her old boots! Just to look at mind you, but I have them! I have signed up for some of your webinars, Mary Beth, but I'm usually working when they are live and there was at least once that I'm pretty sure I didn't get the email for the review. And I couldn't figure out how to get it. I will probably try again, though. I'd LOVE to join the webinar, but it's at 3 am my (Australian) time. That's why I need the book! Well, we live in hope. Even though I live near Dallas I am a mary jane girl! See you tomorrow. I'm a cowboy girl! Had my own daisy air rifle, even. I do online webinars any time I have the budget and time. I'm a Mary Jane girl and I do sigh up for webinars and online classes, including this one tomorrow. I find it is like being part of a class with teachers I enjoy, plus you can stop and replay if you missed something and you are not interrupting any one! I'm a Mary Jane girl! I love online classes because I live in the UK and it's the best way to get access to US artists and teachers!! I am definitely a little bit cowgirl and a little bit Mary jane! A little over 5 yrs ago I never dreamt that I would become "disabled", living with chronic pain and daily limitations after 30 yrs as a RN, but that is what happened and I cannot say enough about online crafting/metal smithing/collage addict classes, they literally saved my life, they gave me a life! Between online classes and artist books I have a new life and purpose, I would do more, the only reason I cant is of course money! So a big thanku and hugs to all u very generous artists, u saved me! Aloha, angi in hana ps Marybeth, your sweet husband let me send dollar bills as I would save them to start my addiction to your stencils, as I did not have a credit card, tell him tx too! I'm a Mary Jane girl. I am signed up for this webinar. But, I have not signed up previously because there are other companies that offer ustream classes for free. I love Stencil Girl products and would love to see even older classes that have been on Webinar on YouTube. Looking forward to this webinar! I am more of a cow girl than a Mary Jane (although I do wear Mary Jane shoes!) live in the country and have livestock - well ducks and chickens :o) I would love to do more online classes but due to being in rural England my broadband is awful - I do like the replays though - when I can download them - love your stencils too!! I am definitely on the cow girl side. I love to ride horses and was always a little tomboy-ish as a kid. I sign up for webinars sometimes but most of the time I am at work. You are supposedly supposed to get a copy of the webinar if you cant make the time and day, but I have had a heck of a time getting the copy. (not from you!) It gets very frustrating especially since you usually pay. I am a total cowgirl! I could care less about clothes and have never minded getting dirty. Love the outdoors and being around animals. I usually don't sign up for webinars because they are held when I'm at work, and even if I get a copy later, I don't know, it just doesn't seem the same as being on live. I am toastmasterliz (at the infamous) live (with the dot com). I still love wearing Mary-Janes! I do sign up for online classes but am very bad about follow-through. I am more of a Mary Jane girl! I have a hard time with online classes because my work schedule is so erratic! Can never count on specific days off, and I work all different shifts! Makes it a challenge to plan things! Being a native Texan, I am definitely a cowgirl! Love the boot! Cowgirl for sure. Love being outside and using a chainsaw. Can't wait for the webinar. Guess I'm a Cowgirl since I live in TX, married to a TXan and have TXan pets! I do as many workshops and webinar as I can and time allows - some you just can't lasso in. I'm a Maryjane girl. I like online courses but sometimes forget to look at them. A cowboy Mary Jane girl. I often forget what I signed up for or when it is! I do like webinars and use them for sewing. I am a cowgirl type. I love Webinars but usually forget the time/or have an appt. I am a MaryJane Cowgirl. I do sign up for online courses but have a hard time with courses that have a day and time. I am a Mary Jane girl all the way! I love online courses and have taken many. Currently I'm taking three, 2 short courses and one 48 week course). Thank you for having a giveaway! I am more of a "Mary Jane " girl. Girlie all the way!!! I have taken many online classes and stopped for a while because I have many to finish! My new year's rule! Finish what I started! But I can't wait to sign up for the many classes that have piqued my interest. Guess that I have to get moving! gmarkley@clf.rr.com Thank you for a great giveaway. I'm a cowboy girl if that means animals and nature. One of the reasons I don't sign up for webinars is that I work full time and the webinars are offered during the work day or at a time when I already have something on my calendar. I'm definitely a Mary Jane type of girl, I love frills and glitter and, out doors? not so much! So, definitely MJ all the way!